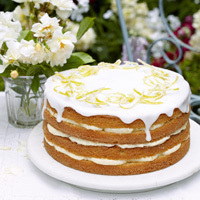 There are three whole lemons used in this cake, icing and decoration, so the flavour is intense and utterly delicious. for up to 4 days in a tin. sponges for up to 3 months. 1 Grease two 20cm (8in) round sandwich tins and line the bases with baking paper. 2 First make the lemon decoration. Peel long strips of lemon rind then cut into fine strips (keep the lemon to juice it for the icing). Place the peel in a saucepan with half the caster sugar, cover with boiling water and boil for 1 minute.Drain and pat dry, then place on baking paper. Scatter over the remaining sugar and dry out in a low oven set at 110°C/90°C fan/Gas ¼ for about 1 hour, until crispy. Cut the lemon in half and squeeze the juice, then set aside for the icing. Increase the oven to 180°C/160°C fan/Gas 4. 3 To make the cake, place the 2 whole lemons in a small saucepan, cover with water, bring to the boil and simmer for 20 minutes or until very soft and tender.Drain and cut the lemons in half and remove any pips. 4 Place the boiled lemons in a food processor and process to a smoothish pulp but still with chunky bits.Transfer to a small bowl.Add all the remaining cake ingredients to the food processor and blend until smooth. Lift out the blade and stir in just over half the processed lemon pulp. 5 Divide the mixture evenly between the two prepared tins and bake for 30 minutes or until golden brown and just shrinking from the edges of the tins. 6 Leave to cool for 5 minutes then turn the cakes out, peel off the paper and leave to finish cooling on a wire rack. 7 To make the lemon filling, place the butter and icing sugar in a bowl and mix till smooth and creamy (you could also do this in a food processor).Add the mascarpone, mix again, then add the reserved lemon pulp and mix until just combined. 8 Cut both cakes in half horizontally so you have 4 layers. Spread the lemon cream evenly between 3 of the layers, stacking them on top of each other. Place the remaining layer on top. 9 Mix the fondant icing sugar with 1–2 tablespoons of the reserved lemon juice to make a thick pouring consistency. Pour the icing over the top of the cake, allowing it to drizzle down. Sprinkle the candied lemon rind on top.